Paneer (pronounced panier) is Indian cheese, which you can easily prepare yourself. It is used in all sort of recipes. For example, peas with paneer, spinach with paneer or in pakora’s. Mix lemon juice with water and stirring it with a trowel. Once the curd is separated from whey (whey must be clear in color), strain the whey off. You can put a cheesecloth in a colander and throw the mixture in there. Wash pan in colander under cold water to remove the lemon flavor. With a twist you turn the paneer firmly into a ball to remove all moisture. Do bread folded in cheesecloth in a wide colander and put a heavy pot on it to remove the load water. After an hour, the paneer is ready if you want serve it. As soon as you start, add a mixture of seeds, ground pepper, fresh coriander and dried mint. Furthermore, proceed as described, except that you do not rinse the paneer. This paneer fits well as a meat substitute for vegetarian main courses. 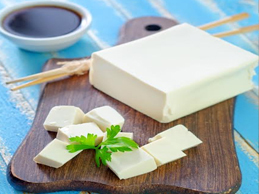 The paneer can be cut into cubes and can be frozen as well.